The Penguins stayed alive in the Eastern Conference final last night, forcing a seventh game on Thursday before we’ll see the Prince of Wales Trophy presented. San Jose could wrap up the Western Conference tonight with a win over St. Louis to claim the Clarence Campbell Bowl. Though they’re both impressive pieces of silverware, the Conference trophies just don’t mean the same as the Stanley Cup. So much so that it’s become something of a tradition in recent years not to touch the Conference championship trophies (the belief being “This isn’t the trophy we’ve been playing for. We want the Stanley Cup”) – and something of a sport to watch and see who does or doesn’t. Even as superstitions go, this one’s kind of silly. 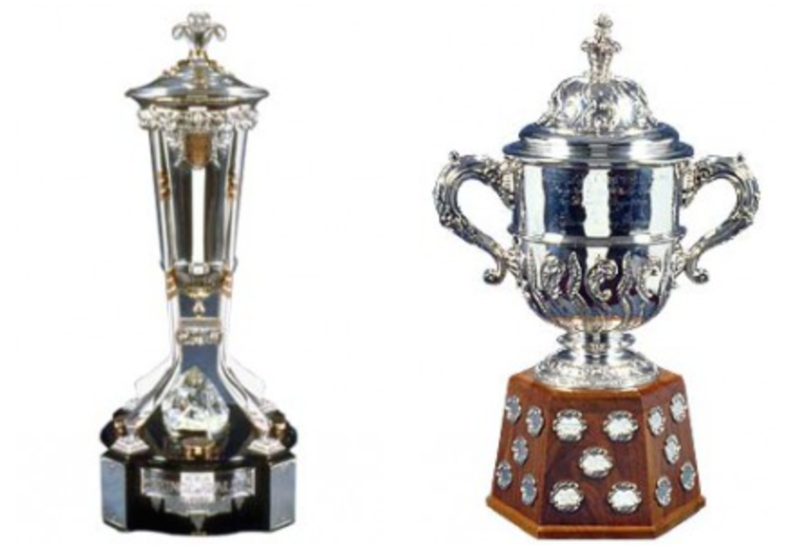 There’s clearly been no correlation whatsoever between which teams touch or don’t touch these trophies and then go on to win or lose the Stanley Cup. And more often than not, BOTH teams don’t touch it, but only one can win. Donated to the NHL in 1925, the Prince of Wales Trophy has been awarded for many things over the years. It’s been presented to a conference champion en route to the Stanley Cup Final since the 1981–82 season, but from 1938–39 to 1966–67, it was presented to the team that finished in first place in the NHL regular-season standings. Sometimes, the circumstances in which it was presented were less than glorious. In 1967, the Chicago Black Hawks finished first in the NHL standings for the first time in franchise history. They clinched first place in game 61 of the 70-game schedule when they beat the Toronto Maple Leafs 5-0 in Chicago on March 12, 1967. Five days later, the Black Hawks arrived in Toronto ahead of their March 18 return date against the Maple Leafs. They discovered a large crate in their dressing room containing the Prince of Wales Trophy. 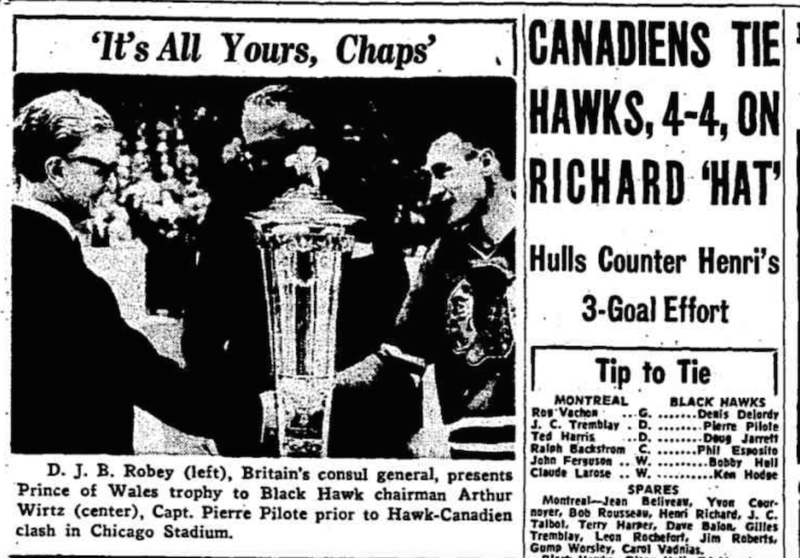 So, the Black Hawks lugged the boxed-up trophy home after a 9–5 loss to Toronto on Saturday night and arranged for their own presentation ceremony at The Chicago Stadium on Sunday, March 19, prior to their game against the Canadiens. Though there’s no actual mention in any story as to whether or not the players ever did touch the trophy, there was certainly no concern about celebrating it! Chicago Tribune, March 20, 1967. After their 4-4 tie with Montreal, the Chicago players departed for the Bismarck Hotel, where they held an official championship celebration. The next day, they were paraded from Wacker Drive and State Street to City Hall, where Mayor Richard J. Daley presented each player with a Certificate of Merit and captain Pierre Pilote took possession of the five-foot tall, gold-tinged Mayor Daley Trophy. No doubt Chicago hockey fans were pleased by their team’s first place finish, but it all went for naught when the Black Hawks were upset in the first round of the playoffs by the Maple Leafs, who went on to win the Stanley Cup in 1967. Toronto hasn’t won the Stanley Cup since … so if there really is some bad luck attached to the Prince of Wales Trophy, it obviously stuck to the wrong team that year! I would be smothering the trophy in kisses! HAHAHA!! !